Different people serve on the frontlines in the ATO [Anti-Terrorism Operation] zone. We regularly meet charismatic and extraordinary people [there]. Serhiy Filippov, Medical Services Corp Second Lieutenant, is one of them. The medical station head of a battalion of a separate mechanized brigade that carries out combat missions in Sector “A” of the ATO, according to the command, Serhiy is not only a great expert, but also a natural comedian and a master of witty jokes. In addition, the 28-year-old medical officer has an unusual appearance: a red mustache and a Cossack oseledets woven into a braid. 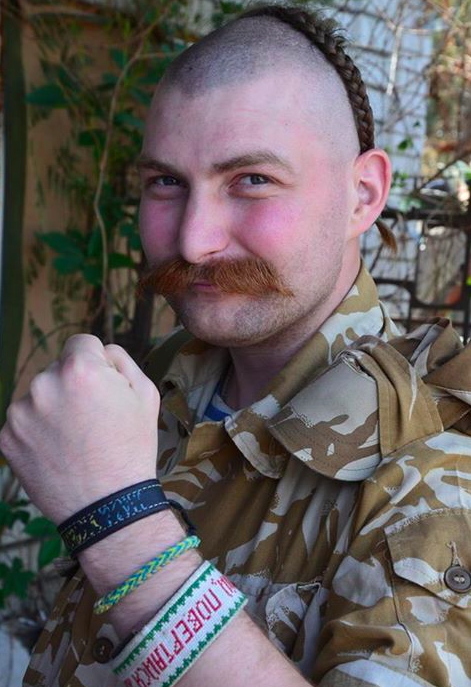 Serhiy graduated from the Kharkiv Medical University and was drafted into the Armed Forces of Ukraine during the August mobilization last year. He is a Donbas native, from the city of Kostyantynivka [Donetsk region]. The military doctor has plenty of work: examining the sick and the wounded, providing medical care, evacuating the sick and the wounded to permanent medical facilities. According to Serhiy, a funny incident happened to him immediately upon his arrival to the unit. He got his own call sign practically on the first day of his military service. Since that time, the soldiers of the battalion call the doctor nothing but “Pirate.” The battalion physician is well-respected, he has saved plenty of lives in his year of service. Besides, by virtue of his cheerful nature, Serhiy always supports the morale of his military brothers. This entry was posted in Dmitry Tymchuk, English, English News, South&Eastern Ukraine, War in Donbas and tagged #freekohver, #FreeKolchenko, #FreeKostenko, #FreeSavchenko, #freesentsov, #RussiaInvadedUkraine, #StopRussianAggression, #UkraineUnderAttack, Kathryn Winnick, Vikings. Bookmark the permalink.